From its inception, Sentient Landscape has been dedicated to demonstrating and installing ecologically sound landscapes that reflect the inherent intelligence of natural ecosystems. Our approach is founded on the philosophy that landscape development can have a regenerative effect on local ecology and community. Our landscape designs focus on whole system planning, building mutually beneficial relationships between all elements within the design. Combining project objectives, comprehensive site analysis, and a refined aesthetic sensibility for flow and form, Sentient Landscape produces effective, resource rich designs that work in concert with the environment. This approach not only saves energy, water and expense, it inspires the community, improves environmental health and resilience, and is a beautiful complement to urban, suburban and rural infrastructure. Sentient Landscape Inc. is a licensed design and installation firm located in Sonoma County, California. We work on projects of all scales including residential landscapes, commercial developments, farm and vineyard design, co-housing developments, parks and open space, schools and street-scapes. Sentient Landscape is LEED Certified. Our project standards meet or exceed the ecological building recommendations outlined in outlined in LID, and other green building rating systems like LEED and Bay-Friendly, and our firm continues to be an innovator in this exciting and timely field. We pursue a program of continuing education, in an effort to expand our knowledge base and to keep pace with the quickly evolving green industry. The primary Sentient Landscape designers are dedicated educators in the permaculture and ecological design fields. Our firm is committed to sustainable design. Sustainability is about meeting resource needs without compromising the ecological framework that will support future generations. Ecologically sound design is a long-term investment that makes short-term economic sense. Sentient Landscape Inc. demonstrates the principles of sustainability in its landscape practice and business operations, including the support of local businesses, and by providing educational opportunities for employees and community members. A licensed, LEED certified landscape contractor has been working in the ecological land development field, designing, building and maintaining effective whole system landscapes for over seventeen years. 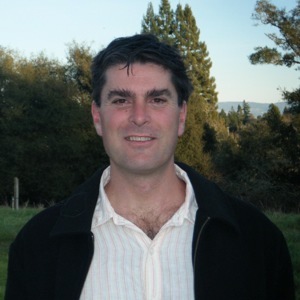 He is a consultant and lecturer for innovative ecological landscape programs in the greater San Francisco Bay area including the Bay-Friendly Landscape program (StopWaste.org) and the Sonoma State University Sustainable Landscape professional certificate program. Geoff Hall, co-founder and principal designer of Sentient Landscape, a permaculture and regenerative design/build firm, and lives in Sebastopol, California with his wife and partner Kamala Bennett and their daughter Marlena, where they are establishing a two-acre certified organic, permaculture demonstration farm.